Don’t like the idea of having your mug identified in secret by a hidden camera? Neither does associate professor Isao Echizen of Japan’s National Institute of Informatics. As a result of developments in facial recognition technology in Google images, Facebook, etc. and the popularization of portable terminals that append photos with photographic information (geotags), such as photo location and time, as metadata when the photo is taken, information such as when and where photographed subjects were is revealed from the disclosed photo of the person concerned via photos taken and disclosed without their permission. His answer to the potential that facial recognition technology offers for privacy invasion is in the nifty goggles shown below, which upset cameras with outward-facing infrared lights. 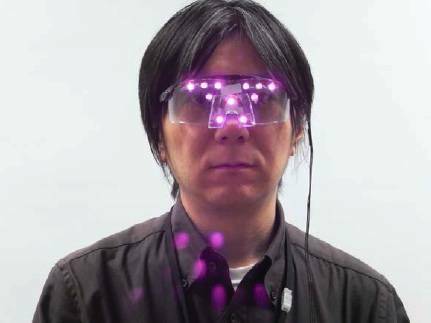 Privacy “is achieved by the photographed subject wearing a wearable device – a privacy visor – equipped with a near-infrared light source that appends noise to photographed images without affecting human visibility,” Echizen writes.